Lovachora -লোভাছড়া (also spelled as Lobhachora, Lovachara) is located in North-East of Kanaighat Upazilla in Sylhet district. The specific location is in beside Khashia-Jainta Hills. Lobha river flows beside Kanaighat. Lova river: During the boat trip you will feel the beauty of Lobha river. Lobha river is a natural combination of river, hill, trees. Crystal clear water will amuse you. 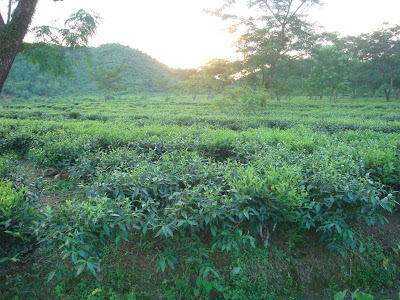 Lovachora tea estate: This tea estate started since British rule. When you will walk around the tea garden, you will see tree lines on the road. You will feel the green nature and fresh air so closely. Lovachora Hanging bridge: The local name of this bridge is Lotkonir Pool. That means local people named this bridge as Lotkonir pool. 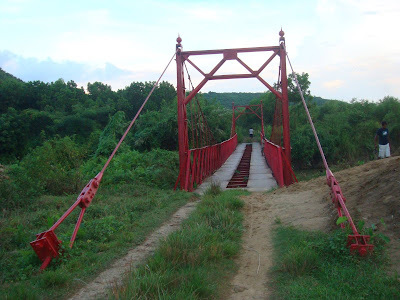 This bridge is another attraction of Lovachora. It’s almost a 100 years old bridge constructed in 1925. The true beauty of Lovachora can be observed when you will go through this bridge. Natural lake: Couple of natural lakes enriched the loveliness of Lovachora. Lakes are though small in size but the water of these lakes is truly crystal clear. Fountains: As the place is a natural place with combination of tea garden, hills, river, so there without fountains it’s not fulfilled someway. Yes, natural fountains are magical. Don’t miss them when you are there. How to go Lovachora: First you need to go Sylhet if you are from outside of Sylhet. From Sylhet you need to go Kanaighat Shadar. You can get Kanaighat Shadar by bus or CNG autoriskshaw. The route will be Darbosto-Chotul. The bus fair should be around 50 taka per person from Sylhet to Kanaighat. You can also take CNG autoriskshaw as well. Afer reaching Kanaighat, get engine boat from Kanaighat bazaar. For the boat trip, it will take 40 to 60 taka per person. Where to stay: There is no such arrangement to stay there. So make it a day trip. Bring food with you during your trip to Lovachora. After visiting the place, you should get back Sylhet city to stay.